I love Halloween candy; well I should really say I love candy of any kind no matter what holiday. So, of course, I was sucked into the glorious candy aisle at Walmart the other day where the biggest bag of mixed candy bars, a bag of mini Reece’s cups, a bag of Candy Apple Kisses and a bag of Candy Corn Kisses mysteriously found their way into my basket that had previously just had cereal, apples and eyeliner in it. I couldn’t leave it in the car so I brought it in and dumped it into a large bowl and set it on my desk. Of course it’s “meant” to be communal but I was totally ok knowing I’d probably eat the whole thing between now and Halloween. 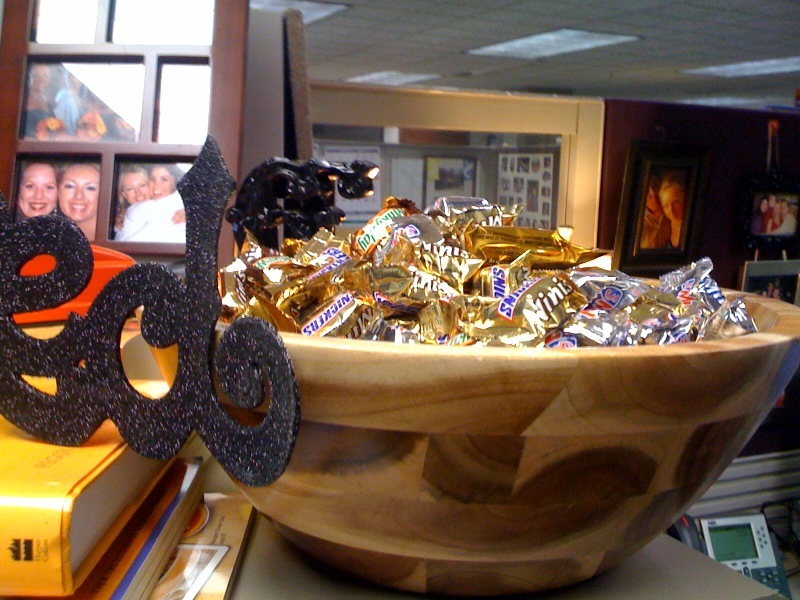 The candy bowl has become a MAGNET! There are people I don’t even know that come by and take from it – not ask if they may please have a piece of candy but take it by the handfuls and horde it at their desks. I actually watched someone take the bowl off the shelf, dig through it and then get a little miffed that I did not have any Baby Ruth’s in there just for them… Clearly, at this rate, the bowl WILL NOT last until Halloween! Candy Corn Kisses? Sounds interesting!